It's hard to believe now, but there was surround sound before Dolby Stereo and digital AC3! Back in the early 1970s, when vinyl records reigned supreme, there was something of an audio boom. Looking for something to sell after stereo, Japanese manufacturers turned to a surround-sound system that employed two front speakers and two rear speakers for improved depth. Or, more specifically, three incompatible systems. VHS inventor JVC brought us Compatible Discrete-4, a format with four discrete channels for good channel separation. For LPs, ostensibly a two-channel format, CD-4 required a special 'disc demodulator' and cartridge, to extract the high-frequency subcarrier upon which the surround channels were modulated in stereo FM broadcast-style 'sum-and-difference' form. 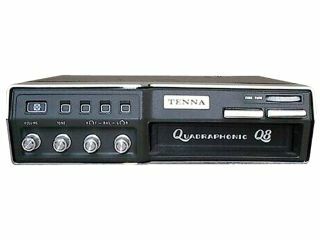 Then there were Sony and Sansui, with their similar (but different-enough to be incompatible) QS ('quadraphonic stereo') and SQ ('stereo quadraphonic') formats. These were matrix-encoded, a bit like the original Dolby Stereo system that came to subsequent prominence, so that conventional two-channel audio sources could be used as programme-carriers. A natural format for quadraphonics was the much-derided 8-track cartridge - instead of offering four two-channel stereo 'programs', it could store two of the discrete four-channel variety. JVC and Pioneer, amongst others, sold quadraphonic 8-track cartridge players for home and in-car use. You could also buy 4-channel reel-to-reel decks from Sony, Teac and Akai - but these proved more successful with musicians and amateur recordists, largely because there were few pre-recorded tapes beyond the supplied demos. Even the BBC toyed with quad FM broadcasting, courtesy of its own 'Matrix H' concoction, but this came to nothing. Quadraphonics' only real software backers were a handful of record companies - notably CBS, Virgin/Atlantic and EMI. Rock fans could, for example, buy quadraphonic releases of Mike Oldfield's Tubular Bells and Pink Floyd's Dark Side of the Moon. Quadraphonics ultimately failed for several main reasons. Firstly, hi-fi equipment (including all those speakers!) was very expensive in real-terms back then - and we were about to enter into a period of economic stagnation. Secondly, confusion reigned thanks primarily to the incompatible formats - which didn't always work that well. The matrix systems fared poorly in channel-separation terms, while CD-4 discs yielded only a few plays before they were too worn to offer their subcarriers intact.